A local building firm asked us to install a simple row of frosted dots across a number of glass panels for a new building. This type of application is popular as it helps glass to be 'seen before it is felt'. Our computer-cut system takes digital artwork and cuts window film or vinyl or any combinations thereof. Shapes and lettering can transform a glazed area in a subtle way or with more prominence. How can window film benefit my business? In a practical sense, window film can reduce energy bills, make glazed areas safer and more secure, protect valuable stock and improve staff productivity. Visually, window film can reinforce your corporate identity and help promote your company message. 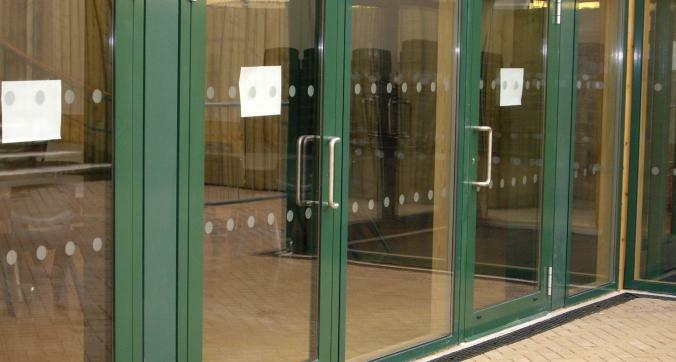 With all commercial and business installations, Tinting Express will visit your premises to carry out a risk assessment. At the same time we will explain the options, answer any questions you may have and test the glass for suitability, before providing a detailed, written quotation. Customer service and great workmanship are the cornerstones on which we rely for future business. Tinting Express has traded successfully since 2000, so our reputation for good service is built on firm foundations. Customers consistently give us positive feedback. We can show you samples of glass with window film applied in different tint levels to demonstrate the difference between clear glass and tinted glass.